The podi (spice powder), pachadi (type of chutney) and the pickle form an integral part of Andhra cuisine and no Andhra vegetarian meal is complete without them. Other than the famous traditional Andhra Avakai (Mango Pickle), Andhra cuisine also boasts of an assortment of pachadis, one of them being Pachi Mamidikaya – Kobbari Pachadi. Raw Mango-Coconut Chutney, is a very simple recipe that is easy to make, healthy and flavorful. 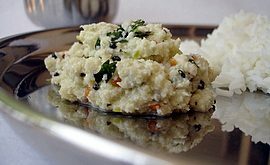 This authentic pachadi, one of Andhraâ€™s raw cuisine side dishes, is traditionally ground in a stone mortar and served with steamed white rice and ghee, tastes the best, the day its prepared unlike few other pachadis that have a longer shelf life. This humble pachadi with a tangy-sweet flavor due to the mango and coconut and subtle spice taste of the green chillis, is prepared by grinding raw mango pieces with grated fresh coconut and green chillis and infused with a seasoning of mustard seeds, fresh curry leaves and asafoetida. Heat oil in a small pan. Add the mustard seeds and let them splutter. Add the split black gram and let it brown. Add the curry leaves and dry red chilli and toss them till the flavors come out. Turn off heat and add the asafoetida and pour immediately to the ground mango-coconut pachadi and combine. Serve with hot steamed rice and ghee. You can also serve with dosas and idlis. I so love that leaf bowl sailu….. I just came to the site to tell u that it was time for a new post..n u already have a mouth watering recipe ready here..!!! Trying my best to get them. Akku bowl chaala bagundi….gudilo prasadam gurthu vasthundi ;-). meeru vaatini emani antaru..?? Another trully amazing sounding dish Sailu [and that plate, i love that plate!]. I just love the combination of flavours on the ingredients list like the raw mango (sour), chillies (hot), coconut(well, coconut? )… sounds really interesting. Maa amma eppudu chestu untaru ee pachadi I love it.I have to give a try. chala bavundi sailu, photos excellent. plus serve chesina a aaku plate superb. Nice chutney.Let me give a try once i get raw mango.i feel to eat this with hot ghee pongal. Coconut-mango chutney yum!! My mother always made this as a combination with vada and I follow her footsteps now. I add a little bit of lemo though just to make it a little tart as the mangoes that we get here are a little bit on the sweeter side..
Arjun,I do make this with vadas and garellu sometimes. You reminded me of my home,we call it Manga Chammanthi,and even without the tadka it tastes excellent,nice to eat with rice or dosa and idli,even with vadas! My mom makes this too. How happy I were when I see this in my school lunchbox! I almost lick my lunchbox clean. She makes it using stone mortar and you are right, the taste of blender ground chutney is never the same. What a lovely recipe Sailu. And I am totally in love with the bowl. It brought back lots of memories of temple meals and functions at my native place. I dont know why we are so eager to give up these environment friendly items and opt for plastic. MT,delicious mango chutney recipe worth trying. I have never heard of this recipe.Neat recipe Sailu!!! Sailu, this is an amazing coincidence!! we were invited to lunch this weekend to an andhra family’s house and this pachadi was served along with many other delicious dishes. It was sooo good. I ate more than my fair share and also shamelessly asked for a doggie bag to take home more and indulge! Oh! How did I miss this blog???? Mango-Coconut chutney!! The best of all! you call chutney, pachadi in telugu? Or is it cos of the poppu? Yes, most chutneys we call as pachadis and vice-versa. can you give me a recipe for indian gourd(dondakaaya) pachadi? This was a favorite of mine back in India. In our house, we made it raw and not cooked. thnx, love the blog and the recipes.